In C language, arrays are reffered to as structured data types. An array is defined as finite ordered collection of homogenous data, stored in contiguous memory locations. or to store list of numbers or characters etc. Since arrays provide an easy way to represent data, it is classified amongst the data structures in C. Other data structures in c are structure, lists, queues, trees etc. Array can be used to represent not only simple list of data but also table of data in two or three dimensions. Here int is the data type, arr is the name of the array and 10 is the size of array. It means array arr can only contain 10 elements of int type. Index of an array starts from 0 to size-1 i.e first element of arr array will be stored at arr address and the last element will occupy arr. One important thing to remember is that when you will give more initializer(array elements) than the declared array size than the compiler will give an error. C language supports multidimensional arrays also. 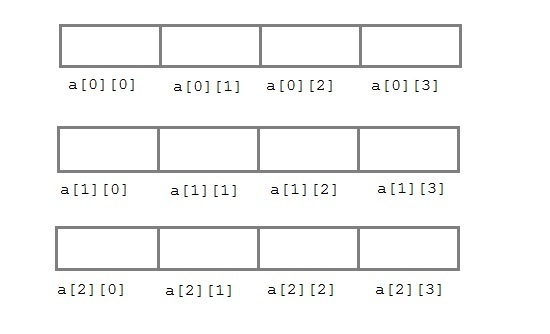 The simplest form of a multidimensional array is the two-dimensional array. Both the row's and column's index begins from 0. Note: We have not assigned any row value to our array in the above example. It means we can initialize any number of rows. But, we must always specify number of columns, else it will give a compile time error. Here, a 2*3 multi-dimensional matrix is created.